So, I posted a week or so ago that I was going to join up with See-Kate-Sew's ruffled apron sew-a-long. So, where's my apron? Still in process. In all fairness to my procrastination though, I have been pretty busy lately. My work schedule is not a Monday to Friday, 9 to 5 kind of gig. I work every other weekend and if it's my weekend to work, I usually get the a day off in the middle of the week before my weekend and a day off in the middle of the week, following the weekend. And life gets busy- there's meetings, and laundry, and doctor appointments for the cat, and groceries to buy, and just life. But, there's still time! 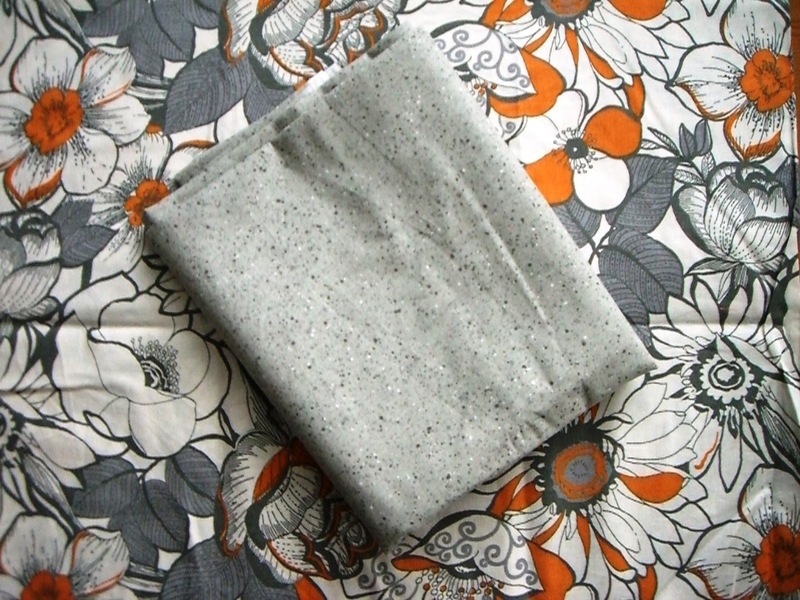 The sew-a-long goes until September 5th, and I have printed the pattern and picked fabric. I decided to use the same fabric for the lining as for the ruffles and pocket. Ready to see? 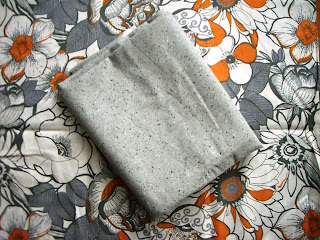 Grey and orange floral and grey eggshell print. Both from Joann's. Sorry, for not ironing it first. I promise, I will iron it before I cut into it. The floral is really cool and is grey and orange. That will be the body. The lining and the ruffles will be the grey speckled. It kind of reminds me of a bird's egg. They're both quilter cottons. So, I actually work Friday night, and then am off Saturday, Sunday, and Monday. But Saturday and Sunday are filling up fast. I'm hoping to have the apron done before work on Tuesday. That'd be the 3rd. That's doable, right? I think it'll come together pretty quick once I cut out my fabric. Any projects you're excited to be working on?